If your hair is long enough, putting it in one or even two braids is a great solution! I’ve been putting in a braid while going to the gym, the beach, swimming and even for a night out, it actually looks really soft and pretty. Just pull your hair to the back or the side, braid it, tie it, maybe use a couple bobby pins if you have layered hair and you’re done. A side benefit is that when you take it out, you’ll have beautiful waves in your hair. 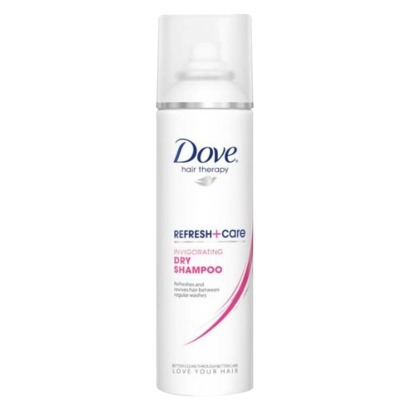 When you don’t have time to wash your hair, try dry shampoo. You can get it at any grocery or drugstore and it’s quite inexpensive. You just follow the instructions and spray it near your roots, rub it in and you’re ready to go. If you want a more natural solution, here’s a great recipe from Wellness Mama for homemade dry shampoo. Another solution for when you don’t have time to wash your hair is one that I’ve used many times. It looks great and is really simple to do. You can buy a sock bun donut or you can use an old (clean) sock, scissors, a hair tie and a bobby pin. Here’s a link to some sock bun tutorials and once you get the hang of it, you’ll love how it looks. And no-one will every know you need to wash your hair! I was a little embarrassed about sharing this at first but it has been so helpful when I’m short on time, that I decided to share. Sometimes when I don’t have time to wash ALL my hair, I pull it back and just leave out the bangs or the front portion. Then I wash and dry that part only. I will pull the rest of my hair back into a pony or braid and the front looks clean and fresh. Kind of gross but also kind of ingenious if you ask me. And lastly, when you don’t have time to wash your hair, it is great excuse to wear all those hats and toques you buy but never end up wearing. And if you don’t own any hats, it’s the perfect time to go buy a couple to tide you over to the next time you actually have time to wash and dry your hair. You can even use a few of these tips together, like dry shampoo and a sock bun or braid. Or a braid and a hat. Or washing your bangs and then a braid. 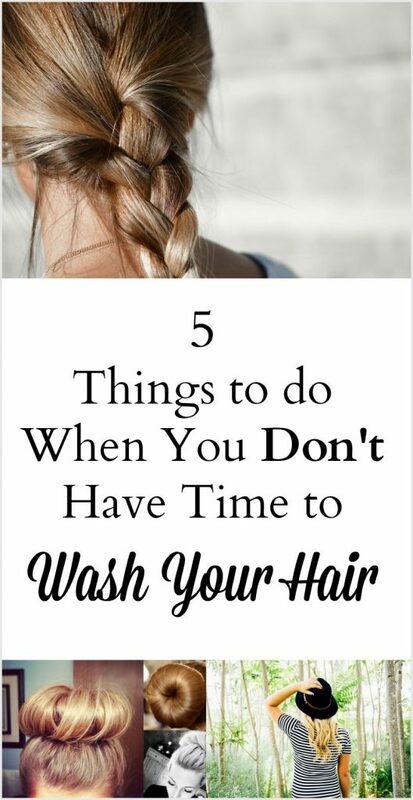 There are really so many ways to get away with not washing your hair when you don’t have time and that’s often a reality for busy moms! What’s your tip when you don’t have time to wash and style your hair? Would you use any of the tips above? Wearing a hat and glass works perfectly! I understand how running a blog can make you limited on time. On those types of days I take my hat off the dresser and my sun glasses. Most people know me for my glasses but wearing a hat is only when I “feel” like it. You should try the homemade natural recipe for dry shampoo Sylvia, maybe that would work for you? I’m guilty of that one. That’s a great tip Jenna, thanks! Oh I definitely like the wearing a fun hat idea. 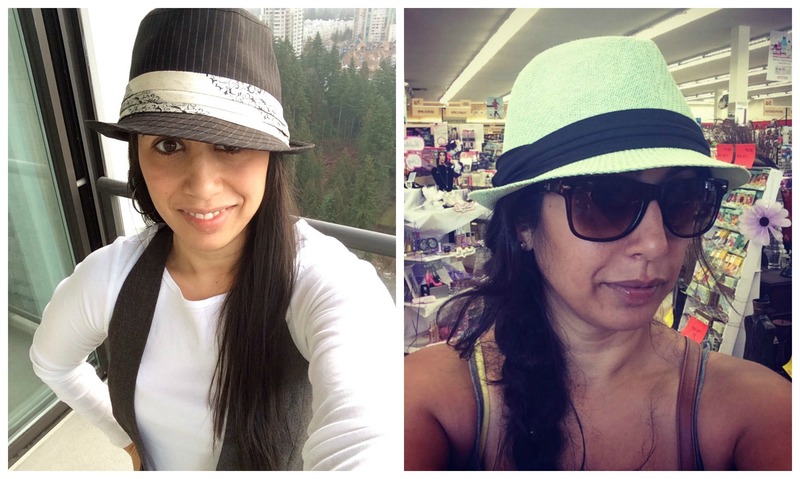 I love wearing hats myself but never thought about wearing one for this reason 🙂 Great pointers here! It’s the braid for me! I’ve been doing that for years. I’ll sometimes stick it in a bun too. Just twirl it around, attach with a clip, and I’m good to go. Thanks for sharing! Heheh love this. If you ever see me with NY hair in a bun it means it needs a wash lol. Love this post. You crack me up. You’re awesome. Yes, I can so relate! Need to have clean hair for my videos, otherwise it’s a ponytail, hat, bandana or GEL for me! GEL works magic, give it a shot sometime! I have yet to try dry shampoo, but there’s nothing like a hat or putting your hair up in a bun to disguise an unwashed hair. I love the idea of a dry shampoo, and I’m totally intrigued by the sock bun. I am going to try it! My dirty little secret – Sometimes I rub a dollop of mousse into my hands, zig zag my fingers over my scalp to tousle my hair near the roots (and make it smell pretty! ), then throw my hair into a messy bun. Love this post!! I still can’t figure out how to do the sock bun on but I do use dry shampoo often and also just wash my bangs in a pinch. 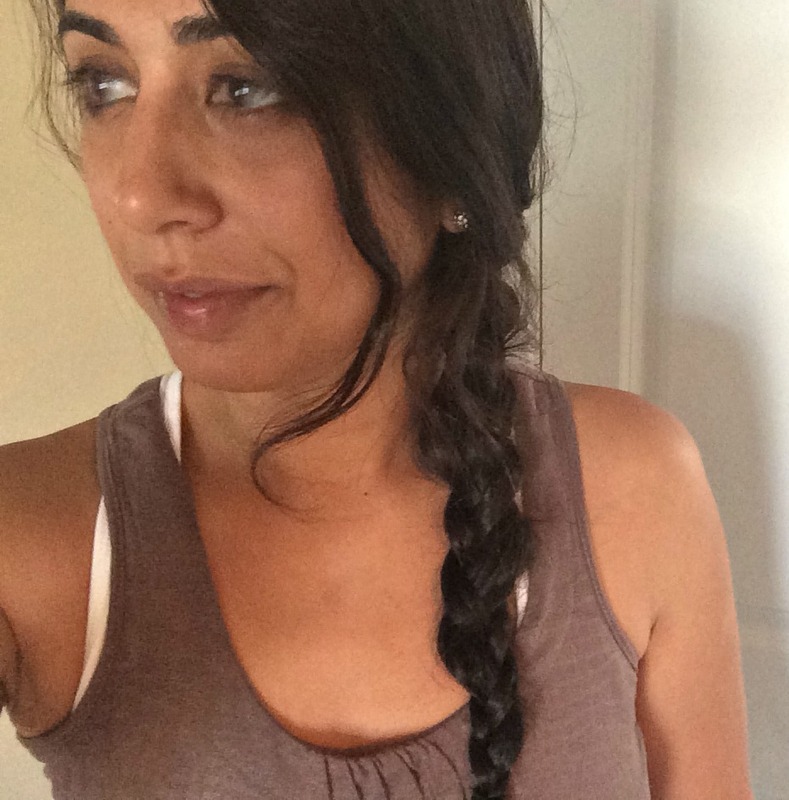 Side braid (or as my daughters call it ‘the Elsa braid’ is also effective).